This year is shaping up to be a great year for the U.S. economy. Given the positive economic conditions, you may be considering to take a side job to earn some extra cash. While having some extra funds in your bank account sounds amazing, remember that it takes money to make money. Without careful planning, your new venture may actually put you in a worse financial position than you originally were! 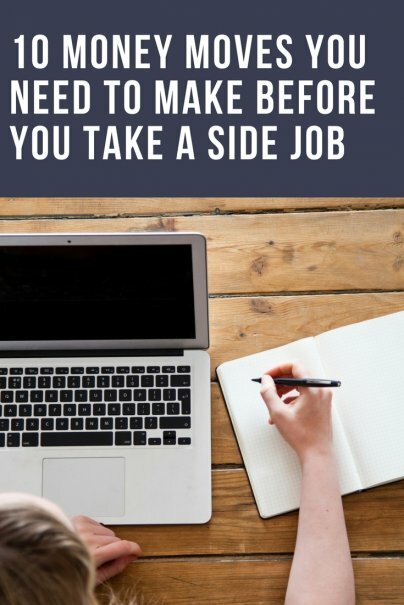 Here are the top 10 things you must do before you take a side job. When you're already employed, you need to consult with your employer about your plans to take a side job. For example, a lawyer may consider to tutor students preparing for the LSAT or the bar exam. However, her current contract may include a clause that prevents her from engaging in such activities for personal profit. To avoid any potential conflicts of interest or breach of contract with your employer, be transparent and talk to your HR representative and supervisor before starting your side job. By seeing that you choose to be safe over sorry, your employer will have an easier time approving your side job. You might even want to consider talking about a salary bump to prevent you from taking that gig and focus all of your attention in your current job. A best practice is to set up a business checking account to keep a clean separation between your personal and business finances. A business account allows you to track incoming and outgoing cash flows and doubles as a bookkeeping tool while you're in startup mode. Minimize fees and maximize interest by looking for an interest-bearing online checking account. Cash is king, but roughly eight in 10 individuals carry less than $50 cash in their wallets on a regular basis. Fortunately, 72% of Americans have at least one credit card. No matter in what industry is your side job, it's a good idea to have a mobile payment tool that can process credit card payments from non-cash carrying clients. If you already have a smartphone, you can use a credit card reader from Square (which charges a fee of 2.75% per transaction) or PayPal Here (which charges 2.7% per transaction). If your side job allows you to complete jobs remotely, consider opening a PayPal account. Many freelancing platforms and domestic and foreign vendors use PayPal as their preferred method of payment. An advantage of PayPal is that under most circumstances, you'll have access to your funds immediately. On the other hand, that convenience costs you $0.30 and 2.9% per transaction. Once those extra funds start arriving, they'll be a source of celebration. However, don't let those same monies become a source of frustration around tax season. Use the IRS Withholding Calculator to estimate how much more you should be withholding from the paycheck of your main job to cover your income taxes. If your income is too hard to predict, remember that you can submit estimated tax payments April 15th, June 15th, and September 15th of the current tax year and January 15th of the next tax year using Form 1040-ES. Speaking of taxes, you need to collect a Form 1099-MISC, Miscellaneous Income for each individual or company that pays you at least $600 during a year for services rendered. While the IRS doesn't require you to submit any Forms 1099-MISC with your federal tax return, the IRS would prefer to see those forms to verify income in case of an audit. Given that the IRS charges a 25% inaccuracy penalty on top of applicable taxes and interest to tax offenders, plan ahead by collecting all of your Forms 1099-MISC. Independent contractors, freelancers, and owners of a sole proprietorship use Schedule C from Form 1040 to determine their profit or loss from business activities. If you file your taxes on your own, carefully review the instructions from Schedule C to deduct all applicable business expenses, including use of your vehicle and home for business purposes, and costs of goods sold, if applicable. If you use Schedule C, you're almost three times as likely to get audited as a corporate filer. Even smart people make tax return mistakes. Now that you're juggling a side job on top of your main job, you may not have enough time to do your taxes. Hiring a tax professional allows you to free up time to focus on your new venture and find out the best ways to deduct business expenses. For example, most tax preparation software only provides one or two ways to deduct your home expenses. Instead, your tax pro would advise to use the square footage of your home space dedicated to business activities to allocate permissible business deductions. One of the most missed opportunities by independent contractors, freelancers, and small business owners is to maximize their retirement savings through a solo 401K. While you can only contribute up to $18,000 to an employer-sponsored 401K for 2015 and 2016, you can contribute up to $53,000 in a solo 401K for 2015 and 2016. Individuals age 50 and over can make additional catch-up contribution on top of those $53,000. By making contributions as employer and employee, you use a solo 401K to boost your nest egg. Consult your financial planner or accountant (and if you don't have one, here's another reason to find one!) to learn more details about how to set up a solo 401K. Are you planning to take a side job this year?